labor-market theory of judicial behavior « Hercules and the umpire. Lee Epstein and Jack Knight are true experts in the study of judicial behavior. They are empirically trained, deep thinkers and excellent writers. They do not grind axes. Lee Epstein is the Provost Professor of Law and Political Science and the Rader Family Trustee Chair in Law at the University of Southern California. She is also now serving as a Phi Beta Kappa Visiting Scholar, a Guggenheim Fellow, and a Lecturer in Law at the University Chicago. Professor Epstein is a Fellow of the American Academy of Arts and Sciences and the American Academy of Political and Social Science. Jack Knight is the Frederic Cleaveland Professor of Law and Political Science at Duke University. His scholarly work focuses on modern social and political theory, law and legal theory, and political economy. He holds a joint appointment with Duke Law School and Duke’s Trinity College of Arts and Sciences, where he teaches in the Politics, Philosophy and Economics Program. If you really want to understand what motivates judges, you must read their a recent article entitled U.S. federal judges are motivated by much more than putting their policy and political preferences into law, London School of Economics and Political Science (October 22, 2013). It is here. For a long time, political scientists thought judges were motivated primarily by their political and policy preferences. But what if that were not true? For one thing, it would cause political scientists to completely rethink their approach to the study of judges. I commend this short article to you. It is well-worth reading as it is brief and yet paints in clear words a portrait of judicial behavior that is far more realistic than standard academic or Conservative/Liberal (Progressive) thinking. *For more of the work of Epstein and others (most especially Judge Posner) about judicial behavior and particularly the judicial behavior of district judges, see my earlier post here. I return to The Behavior of Federal Judges which I have lauded and discussed in earlier posts. The authors (Epstein, Landes and Posner) use a labor-market model that assumes judicial actors make rational choices. The authors consider judges–and specifically district judges–just like other economic actors. That is, federal district judges are self-interested. They are motivated by pecuniary aspects of their work as well as non-pecuniary aspects of their work. One can apply a rational choice model to all sorts of vocations and avocations. Remember, rational actors in the labor market are motivated by non-pecuniary aspects of their work, like opportunities for leisure, and not merely pecuniary incentives. 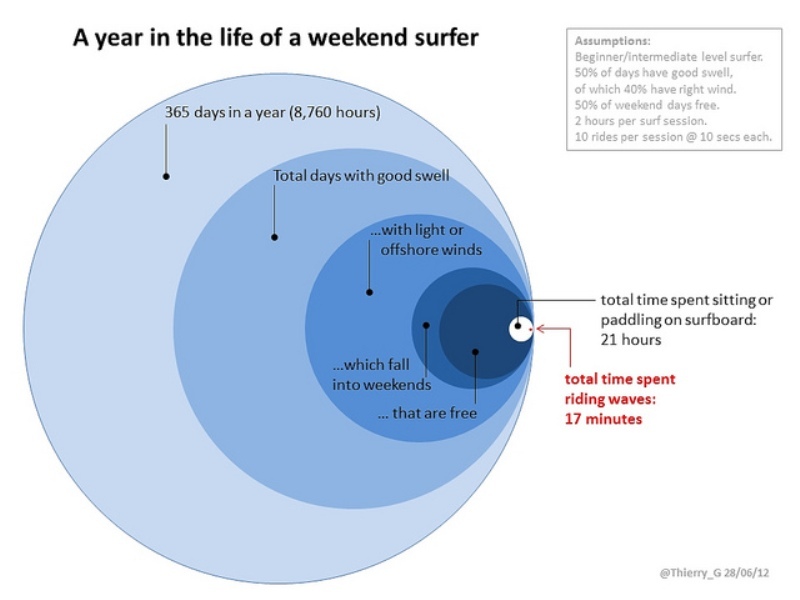 So, just for fun, let’s try to apply rational choice theory to federal district judges who surf but only on weekends. You first need to know what the judicial-surfer actually does before you can apply rational choice analysis. Once you know that, you can begin to question whether a rational judicial-surfer would engage in the activity. Knowing the foregoing, would our rational judicial-surfer surf? In this post, it is best to leave that question unanswered. Later, I will write about psychic satisfaction and how that fits (or does not fit) into a rational choice model of the behavior of federal district judges. For now, surf’s up! Photo credit: By Space & Light Photostream (Thierry Gregorius) per Creative Commons License.